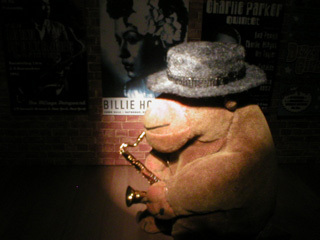 "This is the right hat to leap in with"
Whenever Mr Monkey plays his saxophone, whether he's practicing, or playing to a crowd, he dons his pork pie hat* in homage to the Prez, Lester Young. * which is a traditional pork pie hat, not the more modern ska version. 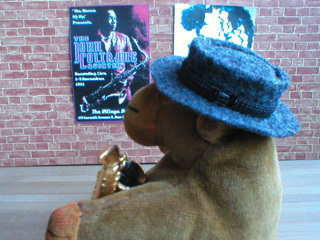 Mr Monkey's porkpie hat is made from felt, with a hatband made from a bit of shoelace. His saxophone is a metal miniature for dollhouses, purchased in Glenridding.